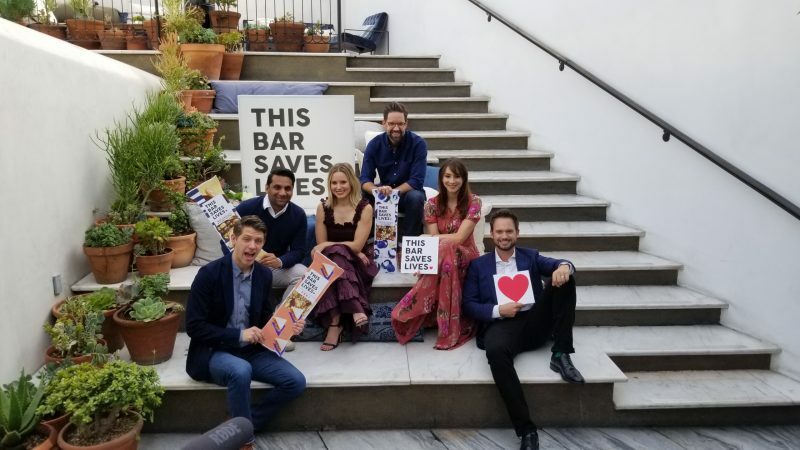 ‘This Bar Saves Lives’ is about to save more lives. On April 17, This Bar Saves Lives granola bars will be launched in Starbucks nationwide (It is currently only sold on the west coast). Starting April 17, Starbucks customers all across America can have the option to purchase a nutritional bar that changes lives with just a purchase. Every purchase of a bar will go towards food aid to a country in need. Sounds simple enough, right? It really is. The company was started by actors Ryan Devlin (Brothers & Sisters), Todd Grinnell (One Day at a Time), Ravi Patel (Meet the Patels), and Kristen Bell (The Good Place) when Devlin and Grinnell saw a lack of nutrition and severe starvation in children in a refugee camp in Liberia. After their trip, the group band together to form This Bar Saves Lives to combat hunger and malnutrition on a larger scale. With each purchase of a bar, they purchase a nutritional packet and donate it to their nonprofit partner Action Against Hunger. To date, the purchases have donated over 3.5 million packets around the world. The partnership with Starbucks is huge for the company, as This Bar Saves Lives has already sold thousands in the few stores that currently do sell their products. Not only are the bars funding an important need, the bars have been taste-tested for a few years before the launch. All bars are dairy free, gluten free, fair trade, Non-GMO Project Verified and bee friendly. They also come in a variety of flavors – dark chocolate & cherry; Madagascar vanilla almond & honey; dark chocolate & peanut butter; wild blueberry & pistachio; dark chocolate & coconut; and, peanut butter & jelly. For more information on This Bar Saves Lives and how you could purchase a box for yourself, click here.